Anaconda is not the type of poker variant that one would expect to find in a casino; it’s more the type of game a group of friends would play together after a few drinks – we would regard wagering as an optional extra when playing this game. Anaconda just about fits into the ‘draw’ poker category because players do not finish the game with the same cards they started with. It’s quite good fun though and it’s alternative names such “Screw Your Neighbour” and “Pass The Trash” should give you some idea that it’s not entirely serious. The aim of Anaconda is to create the best five card hand according to basic hand rankings. Each player now chooses three cards to discard which (and here’s the catch) are passed to the player to the left. No-one picks up the cards until everyone has finished discarding. Another round of betting now takes place. Now each player chooses two cards to pass on as before and anther round of betting occurs. This is followed by one card being passed and another betting round. 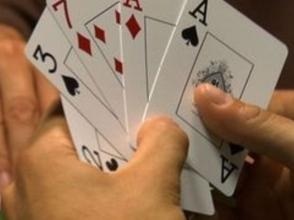 Now each player discards two cards to create their strongest five card hand and the showdown takes place. A common alternative at this final point is for each player to reveal one card at a time, with extra rounds of betting in-between. Anaconda is quite good fun when everyone gets the hang of it and it offers plenty of scope for full variations, especially during home play.